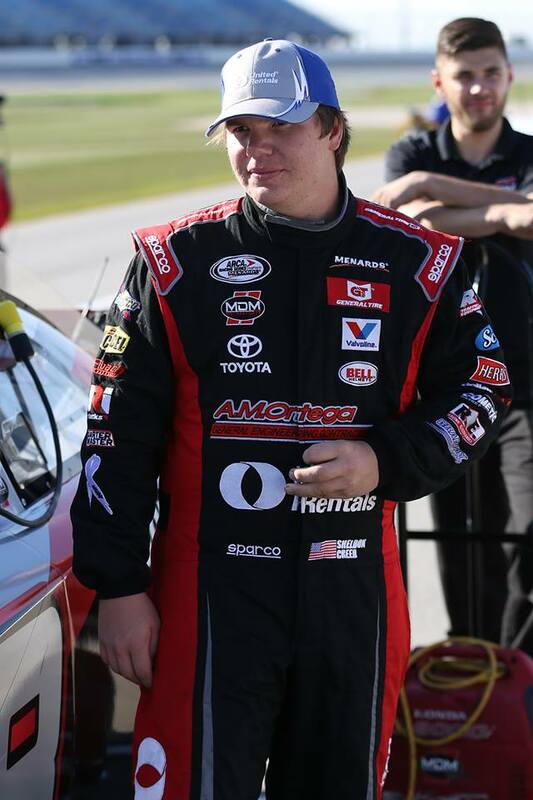 ALPINE, CA, October 18, 2017 (Newswire.com) – Sheldon “The Showstopper” Creed, will have his final chance to score a maiden win in the ARCA Racing Series presented by Menards this Friday at Kansas Speedway. This will be the 20th series run and is the final round of the year. He has been very close to victory several times, but has yet to park his MDM Motorsports Toyota in the Winner’s Circle. The Kansas 150 will be Creed’s 11th ARCA start of the season. In the previous 10 races, he has scored five top-five finishes and eight top-10 finishes, as well as a General Tire Pole Award at the previous ARCA race at Kentucky Speedway. He has also competed in 16 other races in 6 other race series this season, including the NASCAR Xfinity, Camping World Truck Series, and K&N Pro Series East and West, as well as the Trans Am Series and the Stadium Super Trucks Series. Creed will again be behind the wheel of the #12 United Rentals/A.M. Ortega MDM Motorsports Toyota featuring the red and white Davey Allison ARCA-era tribute paint scheme for the Kansas race. This season in ARCA, Creed has alternated between Davey Allison’s iconic #28 NASCAR paint scheme and Davey’s lesser-known #12 ARCA paint scheme. Creed’s connection to Davey Allison comes through his regular spotter and racing mentor, Lorin Ranier, whose father, Harry Ranier, gave Davey Allison his first full-time ride in the NASCAR Winston Cup Series in 1987, famously winning at Talladega and Dover in his rookie season. The ARCA Racing Series presented by Menards Kansas 150 is scheduled for 8:30 p.m. ET on Friday October 20, and will be broadcast live on FS2. Live timing and scoring and race updates will be available at www.arcaracing.com. Sheldon Creed has a brand-new website, developed in conjunction with Race Face Brand Development. It features the latest news on Sheldon’s career, as well as lots of great photos, videos, and radio interviews. Check it out at www.sheldoncreedracing.com. Sheldon Creed, nicknamed “The Showstopper” began racing BMX at age 3 and won 2 motocross championships at age 6. He has won at least one championship every year since 2008.